Graduation Day……. Teen Killer…. | Coptalk.Info - What you do not know will shock you! Graduation day can be one of the happiest and proudest moments a parent can have. But it can also be a tragic life changing experience. Many parents have been to their child’s high school graduation, shedding tears upon seeing their teen finally hit the milestone of adulthood by graduating from high school. But later that evening the same parents shed tears for a different reason after a police officer knocks on their door telling them their child was killed in an automobile accident. This isn’t a fabricated story to scare anyone; it’s a sad but true scenario that happens all across the U.S. during high school and college graduations. Unfortunately, a lot of teens celebrate with alcohol and / or marijuana. Don’t think your child is immune, there may be some very responsible kids out there that don’t drink or party but they can still become a victim of a drunk driver. Usually after graduation there are graduation parties. Sometimes parents think supplying a little beer at their child’s graduation party is no big deal. But it is, and a lot of kids go from party to party, usually bringing their own alcohol. It doesn’t take much nowadays to pass the .08% limit to be considered under the influence. People who drink and become impaired do not believe they are impaired, that’s the dangerous part. Running a red light, stop sign or swerving across a center lane is very easy to do when impaired. Even if your child doesn’t drink, they easily could be in a car with a driver that is impaired. 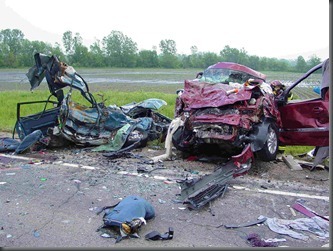 A carload of teens speeding down the road, laughing and having a good time, can tragically turn into a bloody tangle of twisted metal and broken glass. It happens all too often. Think of what it would be like to hear a knock at your door at 1 a.m. and when you open it, a police officer tells you that your child is dead. Really, think about it hard, it should bring a tear to your eye. Many teens have become innocent victims of a drunk driver, being a passenger in a car driven by a drunk driver or being struck by a drunk driver. Graduation week and holidays are one of the most dangerous times to be on the road at night, the probability of someone driving at night while intoxicated during these times is much higher. Have a talk with your child. Let them know your concerns. Tell them you don’t approve of them drinking or being in a car with others who might be drinking. But also tell them that you won’t be angry at them if they call you at 1 or 2 a.m. asking for a ride. Tell them you’ll gladly come to pick them up, no questions asked, as long as they don’t attempt to drive after drinking or get into a car with an intoxicated driver. Even if there isn’t an accident, getting arrested for a DUI results in license suspension and fines exceeding $5000-$10,000. It’s not just worth it. Most high school graduations occur over these two weeks with parties on the weekend so have a talk with your child; it may prevent an officer having to knock on your door at 1 a.m.